The Tottenham Aquaknots was a diving club founded around 1966 and flourished for many years, having more than 80 active members at its peak. However in recent times membership has dwindled and it no longer became viable to continue running the club. Members took the difficult decision to wind up the club in late 2013, but they had to make a decision as to what to do with their remaining funds. 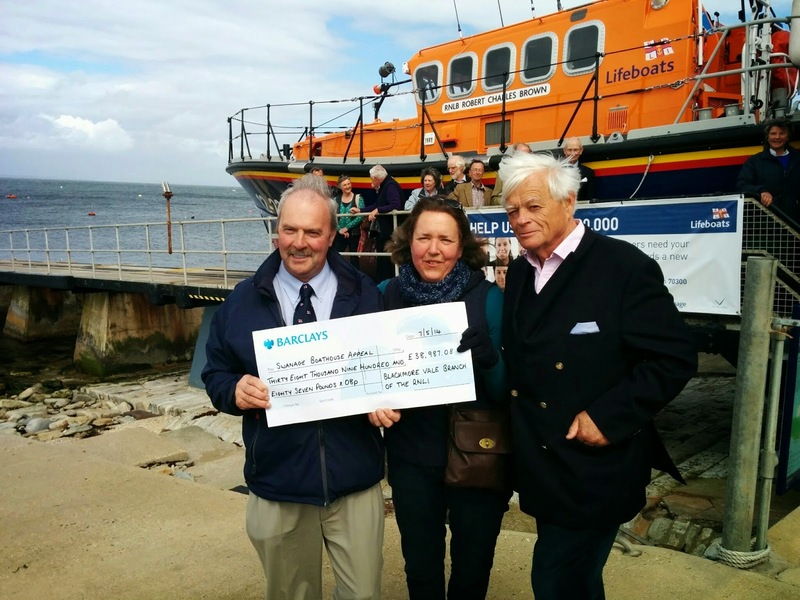 The club took the decision to donate the diving club funds to the Swanage Boathouse Appeal as a thank you to the RNLI. The members of Tottenham Aquaknots always knew the RNLI were there should they require assistance at sea and felt that donating their remainder funds to the Swanage Boathouse Appeal was a fitting tribute in particular as some members have required the services of the Swanage lifeboats in the past. The cheque for over £3500 was handed over to Coxswain Martin Steeden and will go towards building the new boathouse, work on which commenced in November 2014. Containers, containers and more containers! 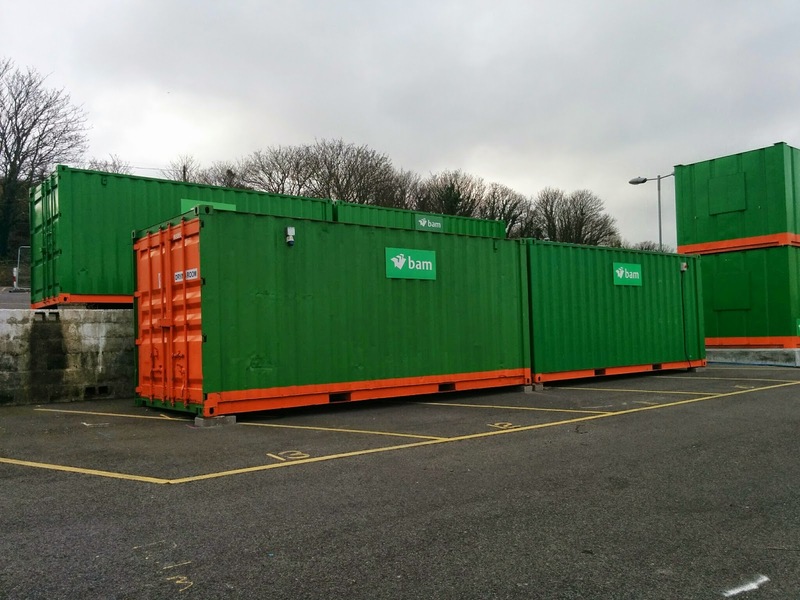 Our contractors (BAM Nuttall) have now got all their containers in place along with the ones that we'll be using and the one for the Angling Club. These are the sites offices, canteen and drying room. This is the Angling Club's temporary building for the duration of the work. These 4 are ours. The two on the lower level will be drying rooms for the crew's waterproofs, one for the ILB kit and one for the ALB kit. Next week these will have a temporary building put over them so that the boats are under cover too. The two containers on the upper level are a store and a workshop. Its been a busy week at Swanage Lifeboat Station. More new launch and recovery equipment has arrived and so has the boarding boat that we'll use to get to the ALB when its on the mooring. Eight of our volunteers have started their training so that they can drive the new tractors. This will continue until RNLI assessors return in a few weeks to assess them as competent. The final piece of kit is a portable fuel tank that we'll use to refuel the ALB. This could be in the boatpark or from the pier if the tide is too low. The first bit of our new launch and recovery kit has arrived! 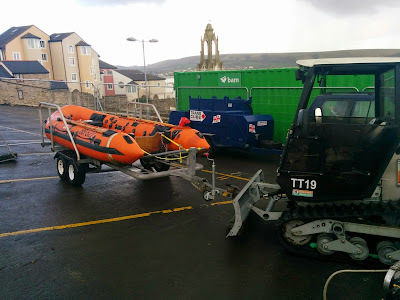 One of the biggest changes for our volunteers over the next few months is going to be launching the ILB and the boarding boat to get to the ALB. Today our ToolTrak arrived. 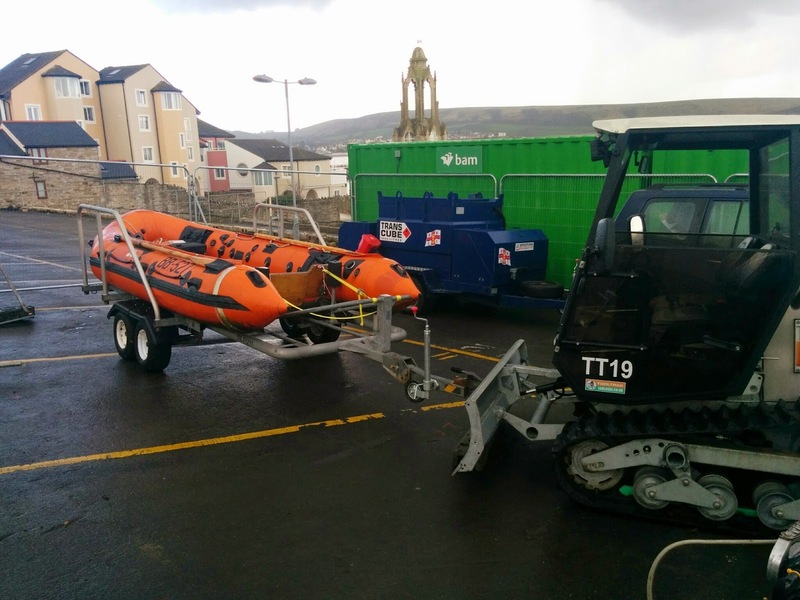 This will be used to launch the ILB from our temporary facilities down the slipway in the boatpark. 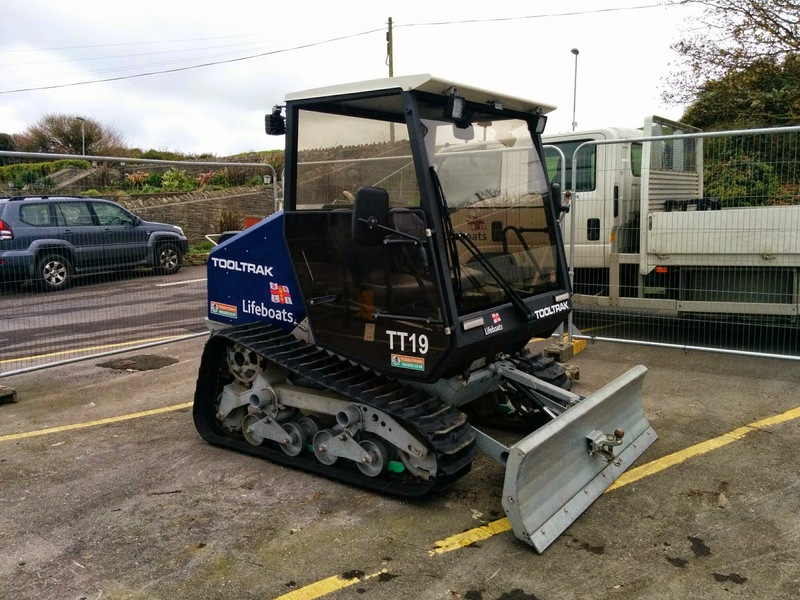 The RNLI Tooltrak is a compact rubber tracked crawler based tool carrier for use in marine environments for the launch and recovery of lifeboats. It is able to wade to a depth of 0.6m and is the ideal vehicle for launching a D Class lifeboat. 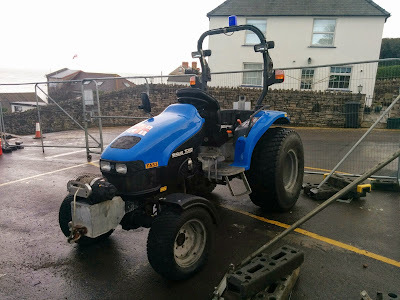 Our tractor drivers start their training on Tuesday of next week, we'll keep you posted on how that goes. The project to demolish and rebuild our lifeboat station has now officially started! 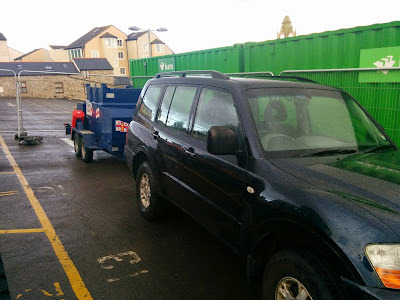 The first of the builder's cabins have arrived today with more arriving next week. The first of our equipment should also be arriving a bit later today, exciting times! In between the rain showers on Sunday 2nd November our current crew and some of our ex-crew gathered at the lifeboat station for a photo shoot and to say goodbye to the lifeboat station that has served so well over the years. We're very grateful to Julian Sawyer for coming to take the photos, he took some really nice shots which we're now able to share with you. This one recreates a shot that was taken around June 1992 when our Mersey first arrived at station. and the current crew and our DLAs. Thanks again Julian, if you feature in one of the photos and you'd like a copy please get in touch. 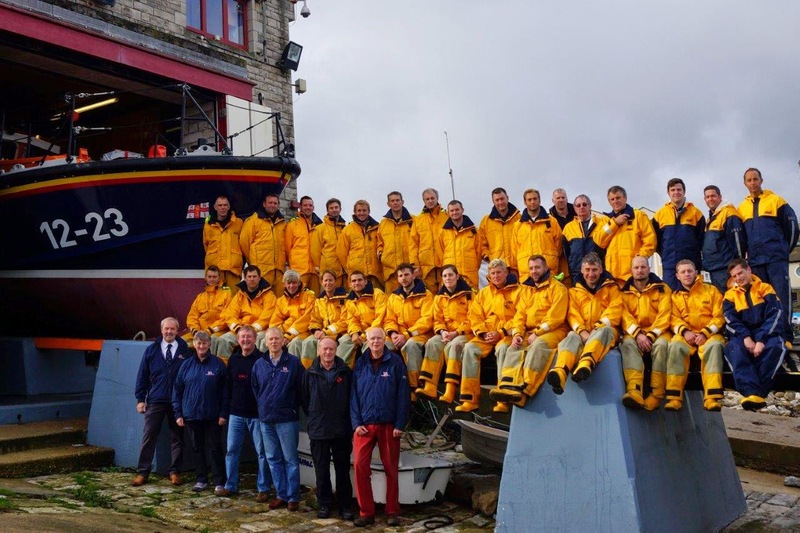 At around 10am on Sunday 2nd November Swanage Lifeboat Crew will be having their final crew photo taken at the current boathouse. 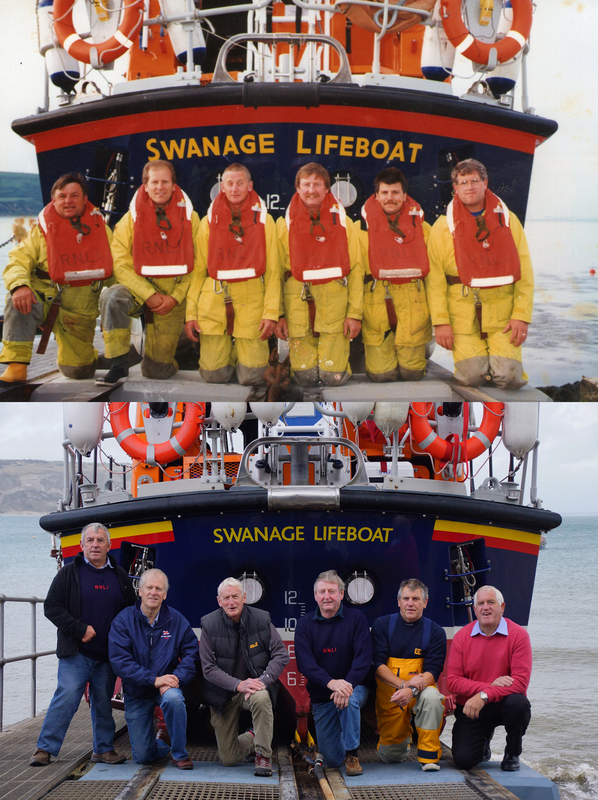 Then at around 11am we'd really like to take a photo of all the people who have volunteered at Swanage over the years. We're also going to put on a few refreshments too. If you know someone who served with us then please pass this message on. It would be great for example if we could recreate this photo from 1992 when our Mersey came to station. This week is the last chance that the public will have to visit our current lifeboat station. The station will close to the public for the last time on Sat 1st November 2014. This is to allow time for the building to be emptied prior to the contractors taking over the site mid-December. Our wonderful team of volunteer boathouse attendants will have the station open all week from 12 - 4pm so why not pop in and say hi. You can also have a look at a copy of the plans for the new building. On Saturday, 11th October a South West train made the trip from London Waterloo to Swanage full of passengers eager to travel along this picturesque section of track which, thanks to a recent agreement between Network Rail, Dorset County Council and Swanage Railway, will become a regular route in the future. 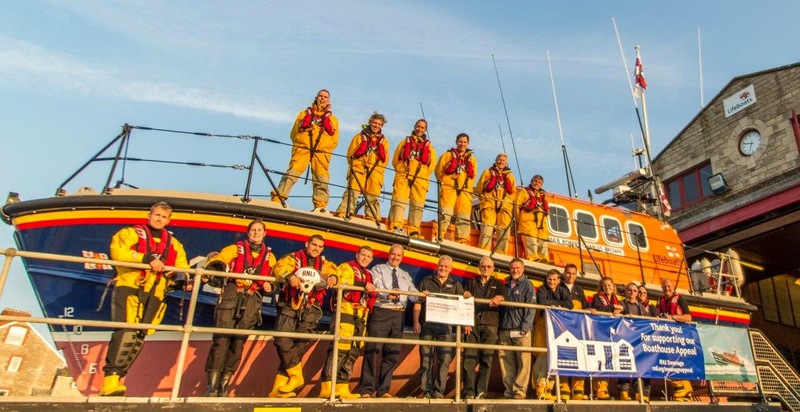 South West trains decided to donate funds towards the Swanage Lifeboat Station Appeal because of the support already given to them by the Swanage Railway at their Diesel Weekend last May. They chose the arrival of one of their trains in Swanage as the opportunity to present members from Swanage RNLI with a cheque for £1,000. Swanage Lifeboat Fundraisers Chairperson, Angela Morris, said "South West trains have been keen to support our local project in particular as the train line from Swanage to Wareham is soon to become a reality." Cheque presented to Neil Brooks, Gavin Steeden and Angela Morris by Phil Dominey, Stakeholder Manager South Western Railway. November will mark the start of one of the RNLI’s biggest construction projects when work begins on the new Swanage lifeboat station. Over an 18-month period, the existing boathouse at Peveril Point will be demolished and a new facility will then be erected in its place. 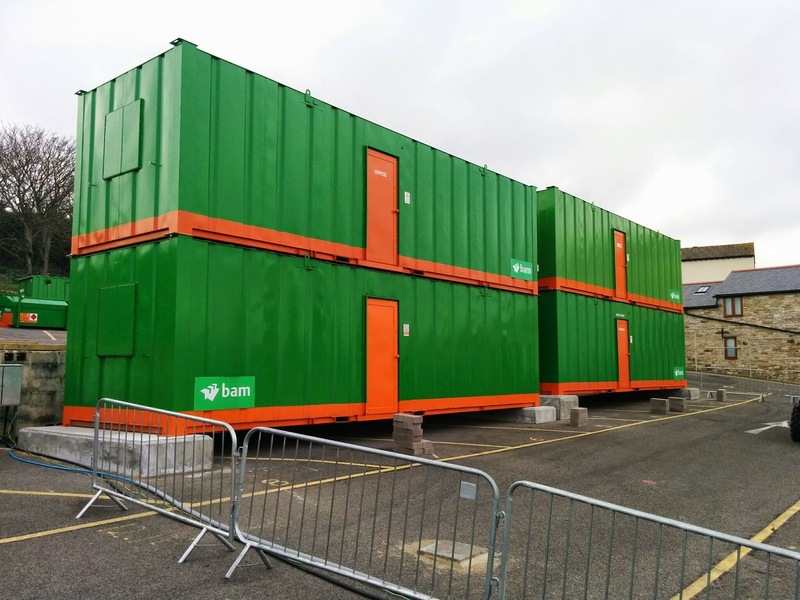 This will house one of the charity’s new state of the art Shannon class all weather lifeboats and serve the station for at least the next 80 years. Designed by Dorset based team, consulting engineers Smith Foster and architects Morgan Design Studio Ltd, the new building will stand in exactly the same place as the old station that was constructed in 1875. As well as housing the Shannon class lifeboat, it will co-house the station’s D Class inshore lifeboat and provide modern facilities for crew training, office space, a warm changing room with toilets and showers and a workshop for the mechanic. The new boathouse will represent a £3.5 million investment, which will be met by the many generous donations made to the charity by the public, including some that have been left in legacies specifically for building projects. 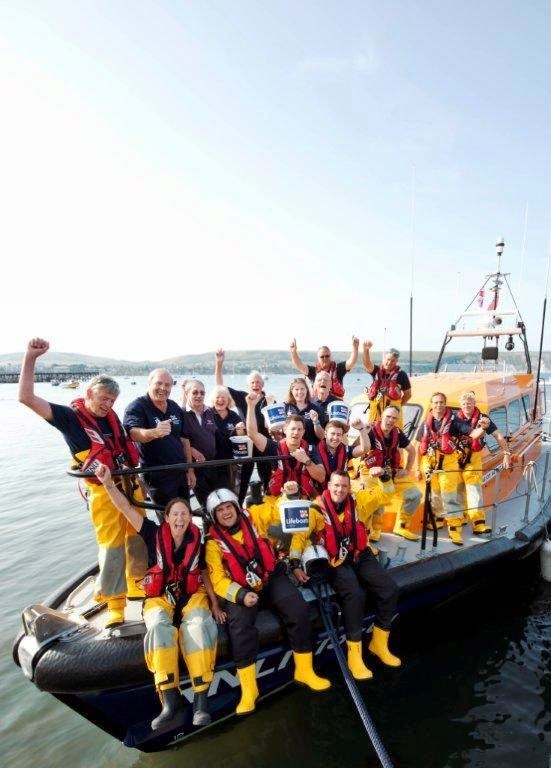 Over £200,000 of which has been raised by local RNLI fundraisers through the community, money which has been raised through local events, personal challenges, and overwhelming support from other RNLI fundraising branches. ‘There’s no pretending that the next 18 months are going to be easy. The demands on the Coxswain and volunteer crew are going to be enormous and I thank them in advance for their patience and goodwill. But we will come out of the project with a superb new lifeboat station that will be a delight to the RNLI team here and a vital investment for the future of the RNLI in Swanage. 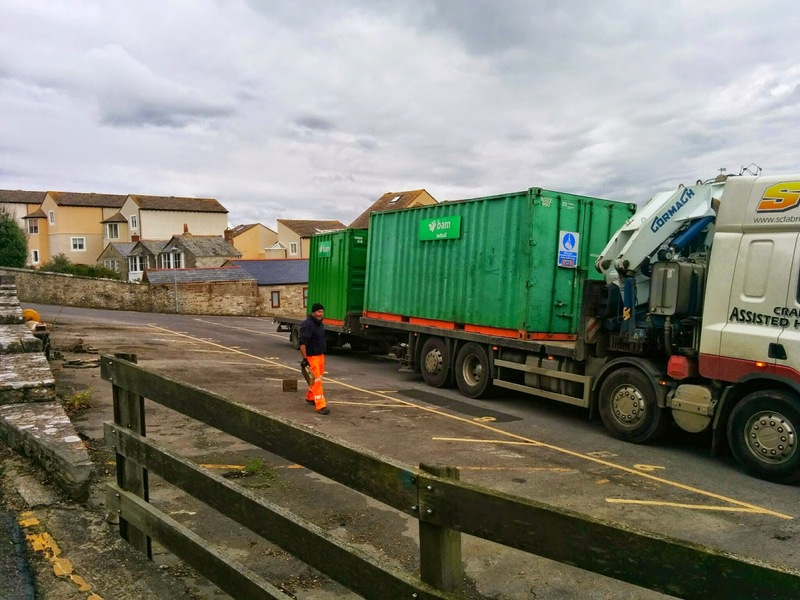 Because of the need for space for the temporary facilities, Swanage Boat Park will be closed from the end of October 2014 to Spring 2016 when the build is completed. The public slipway will remain open subject to the on-going construction work. Where possible these periods of closure will be posted in advance on a dedicated website www.swanageboatpark.co.uk. 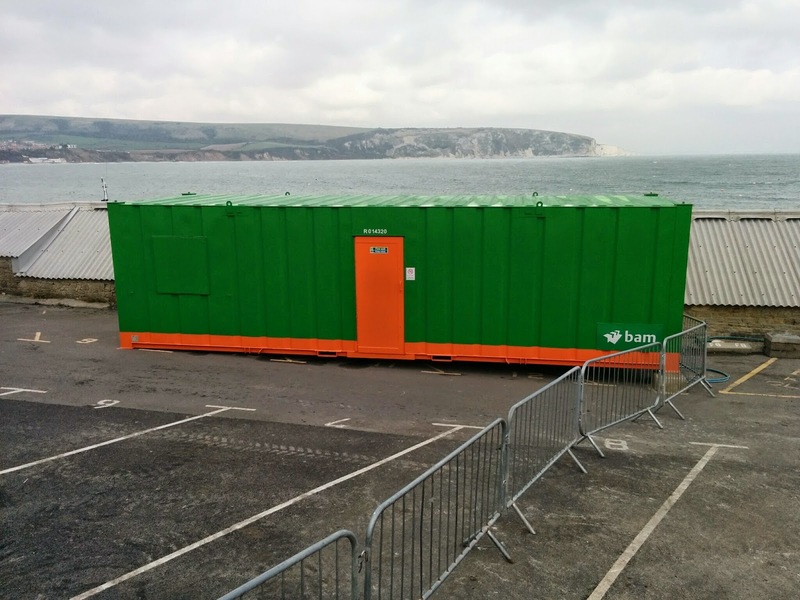 Via the website, boat users can also opt to be kept up to date by email or by following @swanageboatpark on twitter. A special scheme run through one of Costcutter’s suppliers, Nisa, enabled a percentage of profit on certain products sold through the Swanage shop to be collected for donation to a charity of the shop owner’s choice. The total raised by the Swanage Costcutter was £2070.41 and the Tomes family, owners of the local shop, decided to donate the funds to Swanage Lifeboat Boathouse Appeal. The local shop in Herston, today known as Costcutter, has been owned and run by the Tomes family for more than 100 years. 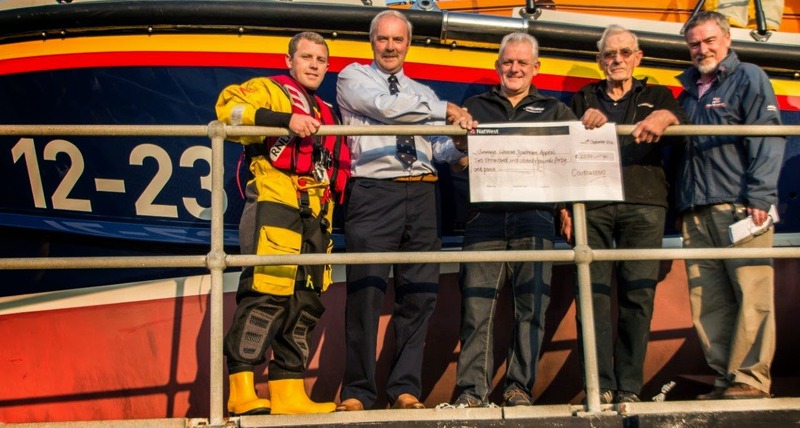 Family members Harry Tomes and his son Keith Tomes went to present the cheque the Swanage Lifeboat Station where Harry’s grandson, and Keith’s son, Darren Tomes is a volunteer lifeboat crew member. 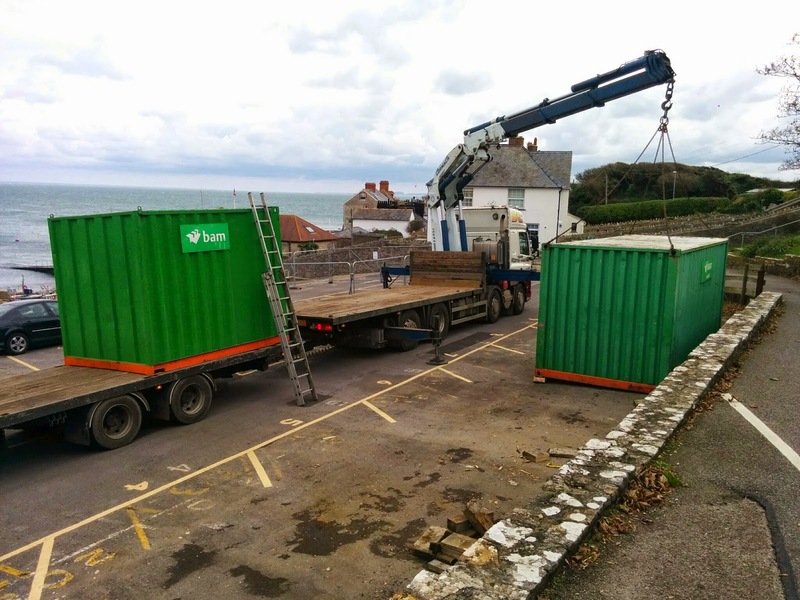 Final preparations are being made for work to commence on the building of the new lifeboat station and setting up provisions for the temporary facilities that will house lifeboat crew kit and equipment in the boat park whilst the building work is underway. It is expected that the Swanage Lifeboat will launch down the slipway of the current lifeboat station for the last time towards the end of 2014, marking the end of an era for the boathouse which has seen the Swanage lifeboats launch hundreds of times over the station’s 137 year history. Golfers enjoying a three day golf tournament which takes place on three different golf courses along Dorset’s Jurassic Coast in September 2014 will be raising vital funds for the RNLI volunteers along the coast. The unique Golf Pairs Tournament is three day competition which uses the Stableford scoring system. Starting on 21 September at Came Down Golf Club and taking place on consecutive days at, Lyme Regis Golf Club and Bridport and West Dorset Golf Club, the tournament will also be played in three different formats, Betterball, Greensomes and Foursomes. The tournament also encompasses four nights Bed and Breakfast accommodation at the Riviera Hotel in Weymouth with a presentation dinner on the final day. ‘It promises to be a unique event, providing golfers with a fantastic opportunity to play against the spectacular backdrop of Dorset’s Jurassic coastline. It seems entirely appropriate to use the event to raise funds for the volunteer RNLI crew from stations at Lyme Regis, Weymouth and Swanage who help save those in trouble at sea along this very coast. The money raised will go towards ensuring that they have training and equipment to be able to continue their lifesaving work. 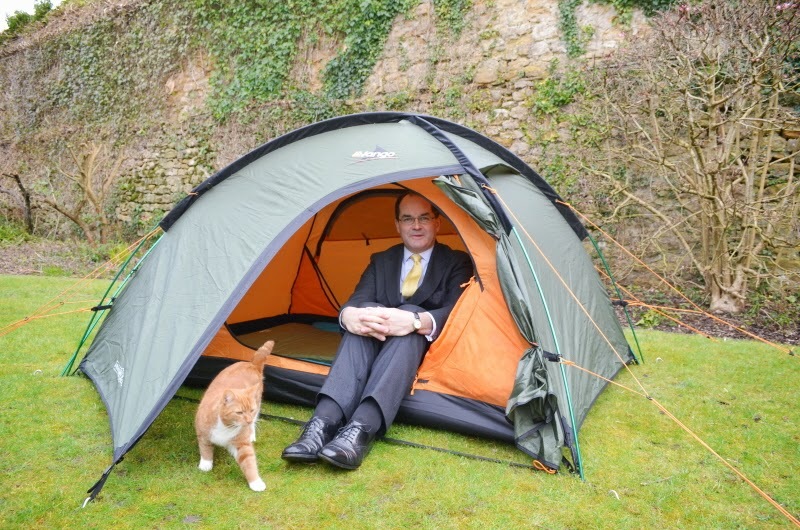 Michael McGinty, the Abbey House housemaster at Sherborne School in Dorset is making his ultimate sacrifice for Lent this year, forgoing the comfort and warmth of his bed for 40 nights. 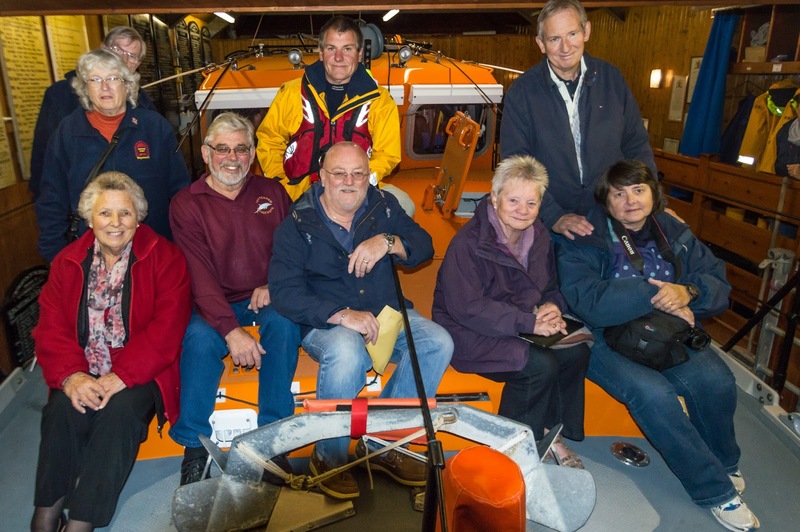 Michael will spend Lent in a Tent to raise funds towards the cost of a new lifeboat station in Swanage, needed to house the town’s next lifeboat, an all-weather 25 knot Shannon class lifeboat. The pupils of Abbey House were inspired to select the RNLI as their chosen charity after a visit from Chief Executive Paul Bossier who delivered a powerful and inspiring lecture to the Sherborne pupils. Our fundraisers celebrate the halfway point in their appeal. 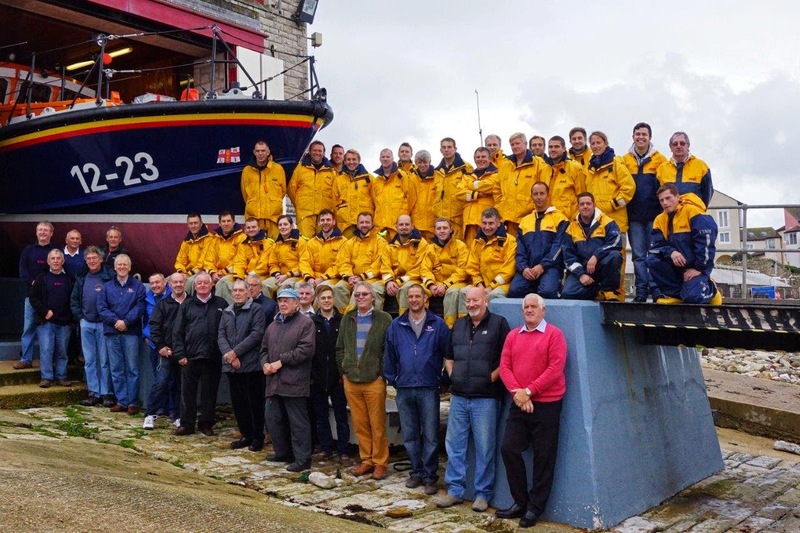 Fundraisers at Swanage RNLI are celebrating this month after collecting over £100,000 in the first eight months of their charity appeal to raise £200,000. The money will go towards the cost of the new station needed to accommodate the town’s next lifeboat, which will be the 25 knot, all weather Shannon class. The new Shannon will offer improved speed and manoeuvrability thanks to updated design techniques and water jet propulsion and is expected at Swanage in 2016, replacing the station’s current Mersey class lifeboat Robert Charles Brown. In July 2013, the Swanage RNLI fundraisers launched a special appeal to raise funds towards a new lifeboat station, which will house, launch and protect the new lifeboat and provide much improved facilities for the volunteer crew including a changing and shower area, a fully-equipped crew training room, mechanics workshop, office space, and a base for the station’s D-class inshore lifeboat. Now, having reached the halfway mark in the appeal, the fundraisers have paused to thank the local community and supporters further afield for their invaluable support so far. ‘It’s been a busy, but fun eight months and events organised by the Swanage Fundraising Branch have included a fancy dress Mama Mia musical sing-along evening, a traditional barn dance, bowls and croquet competitions, the Great Swanage Bake Off and more, all of which have been supported fantastically well by the local community. We’ve also been honoured to have received some amazing support from the community outside of Swanage who have adopted and embraced our boathouse appeal. Some of the support received by the Swanage fundraisers includes the Fordingbridge RNLI Fundraising Branch who raised a staggering £15,000 by abseiling down the Spinnaker Tower in 2013. In February they raised £3,000 hosting a charity auction and are busy planning more events for 2014. 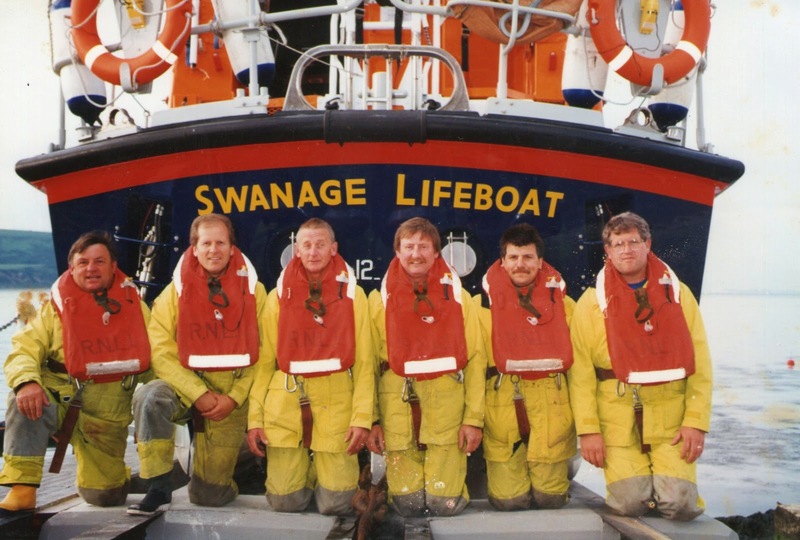 To find out more about the events planned or donate to their charity appeal, visit the station’s blog at http://blog.swanagelifeboat.org.uk You can also donate £5 simply by texting RNLI SWANAGE to 70300. 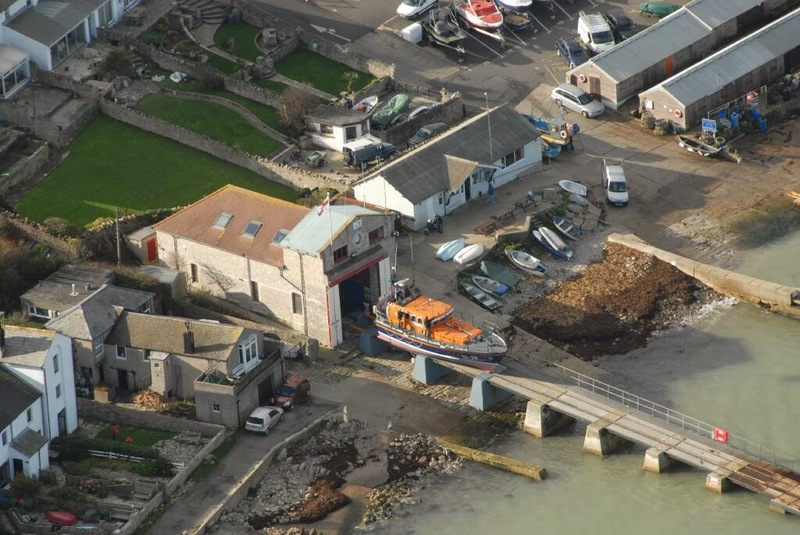 The RNLI has been working on plans to replace the lifeboat station here at Swanage in order to accommodate our new Shannon class all weather lifeboat and improve the crew facilities. We are delighted to be able to invite you along to a public presentation evening at 19:30 on Fri 28th March in the 'Winston Churchill Room' at Swanage Conservative Club. Swanage Lifeboat Fundraisers and the Lions Club of Swanage are holding a 50/50 auction of promises on Sat 15th March 2014 at The Old Malthouse, Langton Matravers. Doors open at 17:45 with viewing, food and bar from 18:00. The auction itself will start at 19:00. Tickets are £5 per person to include a ploughman's supper. Items include, gym membership, beach hut hire, use of a holiday cottage in Malta and tickets to camp Bestival. In total there are over 50 lots so make sure you have a look at the complete catalogue by clicking on the link above, there really is something for everyone.